The region of Campania is well known for its archaeological and cultural treasures, featuring, above all, the Roman ruins of Pompeii, the island of Capri and the stunningly beautiful Sorrento and Amalfi Coast. The best cycling, however, is to be found further south, where the largely unknown Cilento National Park awaits you with its wild mountainous areas and rocky unspoilt shores. Few people live here meaning ancient customs have been well preserved and traditional hospitality is still cherished. You'll also get to enjoy the relaxed pleasures of Amalfi and Sorrento as both lively towns also feature on your route, giving you the best of two worlds in one holiday! During the week you will explore the coastal roads of Cilento, passing through some of its most spectacular scenery, with grand views of the Mediterranean. You will explore sleepy little hamlets that seem not to have changed since medieval times and visit some of its most important archaeological sites, including the imposing Greek temples of Paestum (UNESCO World Heritage). Not forgetting some quality relaxation time sipping a cappuccino or a glass of local wine, or lounging on the beach soaking in the warm Mediterranean sun. 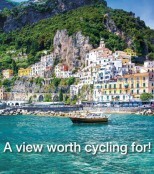 The second part of your holiday will be spent cycling along the wildly spectacular Amalfi Coast, where steep vertical cliffs rise up from the shimmering Mediterranean to make way for little hamlets clinging to the rock faces and lemon groves precariously growing on tiny agricultural terraces. Here you will stay both in Amalfi and Sorrento, visiting the traditional Positano along the way and enjoying the very best views of the islands of Capri and Vesuvius looming over Pompeii and Naples. Spectacular views of the coast are guaranteed during the day and local cuisine washed down with the one and only real Limoncello, will be tempting you in the evenings. An extra day in Sorrento will allow you to enjoy visiting the sites, either heading to Naples or taking the ferry to Capri. The post Escape to the coast appeared first on Skedaddle Blog.